Intense Pulsed Light is a technologically advanced method of removing unwanted dark hair permanently from any area of the face or body. The colour of hair is determined by an amount of melanin, or pigmentation, found inside the hair follicle. IPL light energy targets the melanin inside the hair follicle. The amount of pigmentation in the follicle is reflected in the darkness in hair colour. Blonde, red, grey or white hairs are invisible to the light energy and therefore cannot be treated. The pigmentation is heated and destroys the active cells in the follicle that grow the hair. Once those cells are dead, the hair follicle can never grow hair again. It takes more than one treatment to achieve maximum hair loss. Each hair has 3 cycles of hair growth that it goes through and it is only the active – Anagen cycle that will respond to any permanent removal treatment. There is on average, 1/3 of any area that is in that cycle. Hormones, pregnancy, some medications, some medical conditions, genetic influences all affect the growth of hair across the face and body. Because hair growth can be stimulated by these various reasons, we can never guarantee 100% removal, and individual responses may vary. It may be necessary to have ‘touch up’ treatments as hormonal changes happen over the years. On average 6 – 10 treatments may be recommended for maximum loss of hair and this can depend on hair colour and thickness, skin colour and area treated. The sensation of IPL treatments is often referred to as warm flicks of a rubber band, depending on the area treated and client’s tolerance. There is usually very little redness to the area after treatment, sometimes the skin may feel warm and this is completely normal. After the treatment, the hair is still in the follicle and will be released by the skin after about 10 – 14 days. The hair will just drop out. It is very important during the course of treatments not to pluck or wax, but you may shave or cut the hair. As treatments are done every 4 – 8 weeks, nobody needs to see the hair in between treatments. Depilatory creams can be used if your skin tolerates them. Sunscreen must be worn every day on the area treated if it is to be exposed to the sun. You may not be able to have treatment if you are sunburned or too tanned. As long as you have relatively pale skin and darker hair pigment – IPL is suitable. If you are not sure – we would be happy to provide you with a quick consultation – book online here. Not every skin type is suitable – we will give you a professional opinion and conduct a spot test prior to any IPL procedure. Some skin areas are more sensitive than others. We recommend that you always consult with a trained professional to see if your skin is suitable. Some treatments have little or no sensation at all, but for other treatments, clients may feel a slight sting, similar to the flick of a rubber band against your skin. It is certainly not unbearable, and we can always reduce the intensity if you feel the need. Immediately after some treatments, you may feel a mild heat for a few minutes or a couple of hours, but after most treatments, you will feel next to nothing at all. In most cases, there is no visible reaction and you would be expected to be able to return to work and resume your normal activities immediately after your appointment. However, IPL causes heat in the target tissues; therefore it is quite acceptable for the area to be slightly reddened immediately after treatment, but this would normally dissipate within half an hour. It is possible for the skin to appear slightly red for a couple of hours and up to 24 hours. For those people concerned about wearing make-up immediately after treatment; provided there is no adverse reaction, (which is very rare), we can apply a mineral foundation to your face after your sun block. After hair removal treatments are also common to see a slight swelling at the mouth of each hair follicle, similar to goose bumps. This appearance should disappear within the same frame time as with reddening. A course of 6 to 12 treatments is usually required to treat hairs at all stages of the hair growth cycle, at 4 to 8 week intervals; which varies depending on hair type and colour, and the location being treated. Fair hairs will require extra treatments. White hairs can not be treated. It is hard to give an accurate figure without first talking to you. 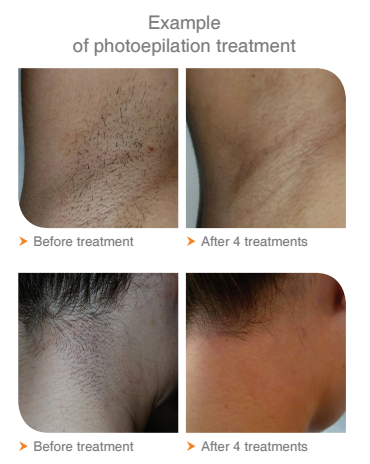 How valuable is permanent hair removal to you? Some clients want large areas treated which require many IPL pulses – these are typically more expensive. If you are unsure – come in for a consultation – if your skin is not suitable, the consultation is free. We also offer a payment plan where you can spread your treatment out with a small weekly payment. Other finance options are available such as Q card. See our full price list here. Typically, unsightly dark hairs around the face and neck areas, lip hair and Brazilians. What happens in an IPL consultation? We make sure you are able to have the treatment, depending on skin type, medications, general health etc. Then we need to look at the area to be treated to make sure the hair can be treated and that the area is not pigmented. It is helpful to have a small amount of hair growth at the initial consultation so we can see the colour and texture of the hair. 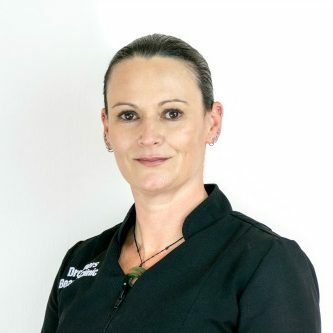 If after having gone through both these initial processes the client is able to have the treatment we will do a spot test on the area to be treated to see how the skin responds, then we can book their first treatment fairly soon after that. We can recommend a course of treatments, and how often they need to be done for best results. We will also explain how the treatment works which will help the client to understand why we do the treatment the way we do. For example, a lot of clients ask why they must shave the area and not wax it so I explain a bit about the theory of how it works. Like to see if IPL is right for you? With advanced treatments like these, it is important to have the correct treatment for you individual skin type, condition, and your own personal beauty goals. Jo would be happy to explain any questions you may have. Email us or phone us on 07 549 1213 to find out more.